Manufacturer: Shenzhen Foscam Intelligent Technology, Ltd.
Surveillance cameras are often considered creepy, but there are many uses that are not sinister at all. Keeping an eye on a sleeping infant, monitoring an elderly parent, or checking your home while traveling can all put your mind at ease. Foscam makes a number of monitoring cameras. Their new R2 Wireless IP camera is packed with useful features. The cute, droid-like R2 (R2-D2, anyone?) is wireless and records still photos or video in 1080p resolution. 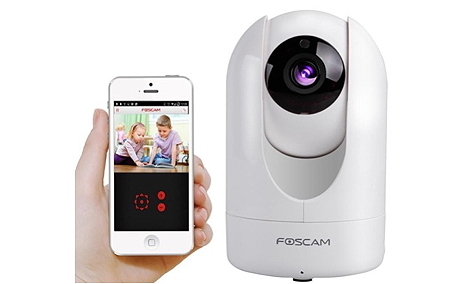 Via Foscam’s app, your iPhone (or Android phone) can be used to view what it sees. The IP designation means that it is an Internet Protocol camera or more commonly, a Netcam. The setup process is easy: simply scan the QR code on the camera with your smartphone and it syncs the camera with your network automatically. The R2 is only five inches (12.7 CM) tall and weighs 2 lbs. (.91 kg). The 110 º wide-angle lens is motorized to pan, tilt, and zoom. This is all controlled with the Foscam app. The camera is equipped with night-vision IR-LEDs capable of illuminating objects within 26 feet. The glow from these LEDs at night is subtle and unobtrusive. The R2 contains a built-in web server that connects to your network. You can sign in anywhere there is an Internet connection and see what the camera sees in real time. We were recently visiting friends in Texas and checking on our home from time-to-time was reassuring. 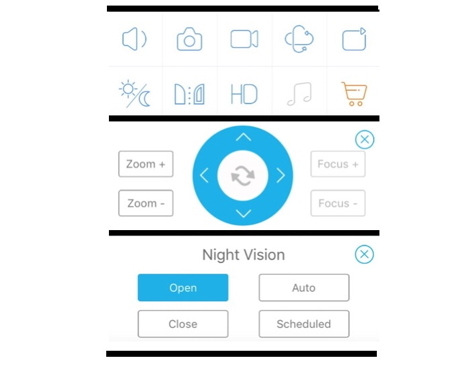 The app provides the ability to detect motion. If it does, there is an optional setting to send you a push notification. The R2 does not have a PIR sensor (Pyroelectric Infrared sensor) so it detects motion but it cannot detect specifically what is causing the motion. The software compares pixels from one image to the next and reacts when they don’t match. Another setting allows you to take photos or videos and store them on a micro-SD card. There is a slot in the base of the unit that will accept cards up to 64GB capacity. The app is set to take one photo per minute whenever the camera detects motion. Three of the settings panels. There is a built-in mic and speaker in the R2 permitting two-way conversations. This could be useful with an elderly parent, a children’s playroom, or someone convalescing. The R2 is not just for home use. Since the app allows up to five units to be linked simultaneously, this seems like a good security system for a small business or retail store. The unit comes equipped with a wall mount that allows multi-positioning, even from a ceiling. The app has settings so that whatever mounting position you use, the image will appear right side up on your phone. The R2 includes a standard tripod socket as well. At the time of writing, there are a couple of important features in development. First is an iPad app. Much of the benefit of high 1920 x 1080p resolution is lost on a phone’s small screen. Pinching and zooming enlarges the image well but when Foscam releases the iPad version of their app, viewing details should be much improved. Second is Cloud recording over longer periods of time. Apparently, this will be a paid feature when it becomes available. Although Foscam insists that the R2’s signal is thoroughly encrypted. I admit I’m conflicted by the convenience of being able to monitor things and the possibility of a prying hacker gaining access. As much as I’m impressed with the camera’s image quality and ease of set-up, there are some incongruities and missing features: Although there is a Windows app, there is no Mac app. Although there is an iPhone app, there is no iPad app. Zoom, tilt, and pan are a bit jerky and often require several taps to move the lens. The R2’s software and user manual is included on a 3-1/8” (8cm) mini-CD. (Wait, wut? I didn’t realize those were still being made!) Good thing that these items can be downloaded from Foscam’s site. 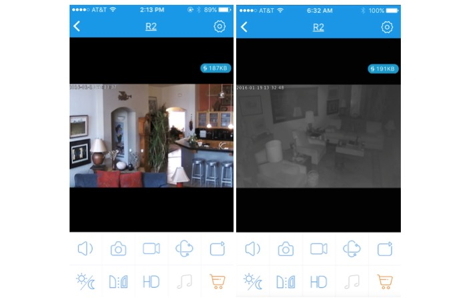 The R2 Wireless IP camera is well-made, nicely designed, and works well. I have no hardware issues at all. There are some firmware and software shortcomings that I hope will be fixed with updates. Since I have had this camera there have already been two firmware updates. I’m optimistic about future fixes since this demonstrates that Foscam is paying close attention.